Annual testing of more than 11,000 citrus trees for citrus tristeza virus (CTV) was completed last week at Lindcove REC. This year we found eleven trees infected with the virus, thus the average infection rate was one per thousand trees. This phloem-limited virus is vectored by several species of aphid. Infected trees are removed from the research plots to help protect the research from the disease. Funding for testing the trees is provided by the California Citrus Nursery Board. 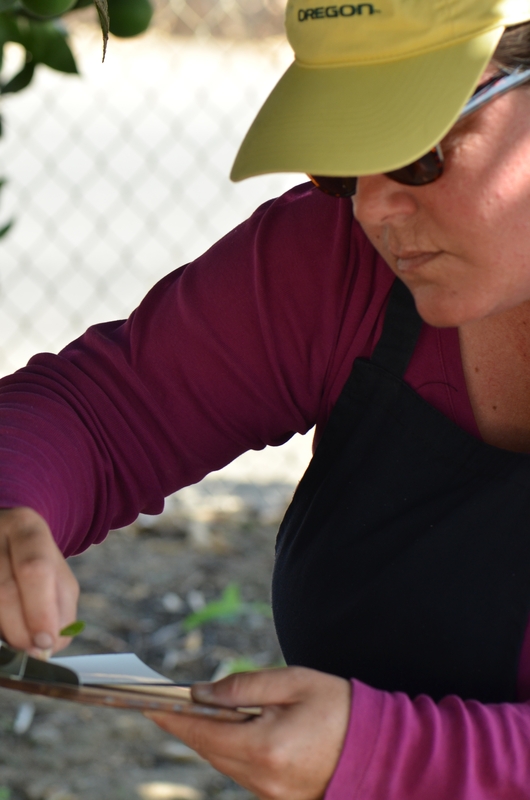 Over the course of four weeks, six temporary field staff sampled four young leaf stalks from each tree under the direction of Therese Kapaun, Staff Research Associate at Lindcove REC. Stalk ends were cut and pressed directly onto a nitrocellulose membrane, then later processed in-house at the Plant Pathology Lab using a serological DAS-ELISA bioassay. 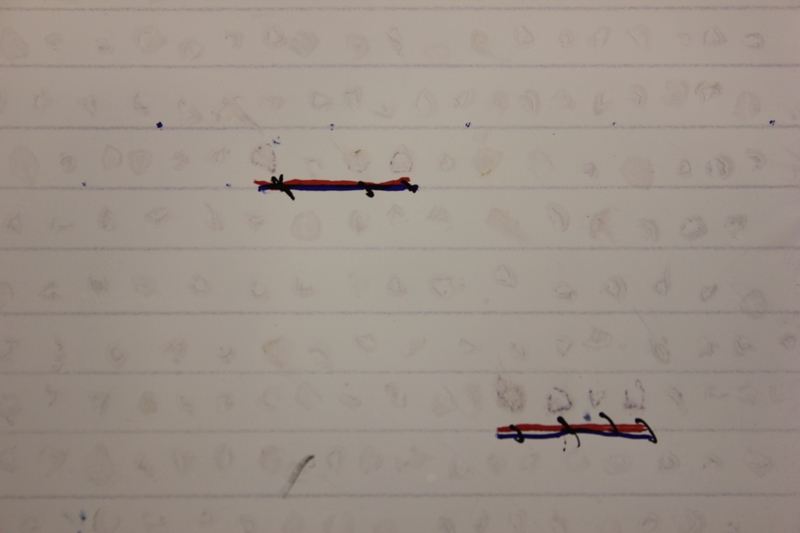 Blots that were visually positive with this technique were then processed by Therese at a molecular level with RT-PCR, which also allows for virus strain identification. All infected trees were found to be infected with a common asymptomatic T30 strain, and fortunately were not infected with strains that cause severe symptoms such as stem pitting. 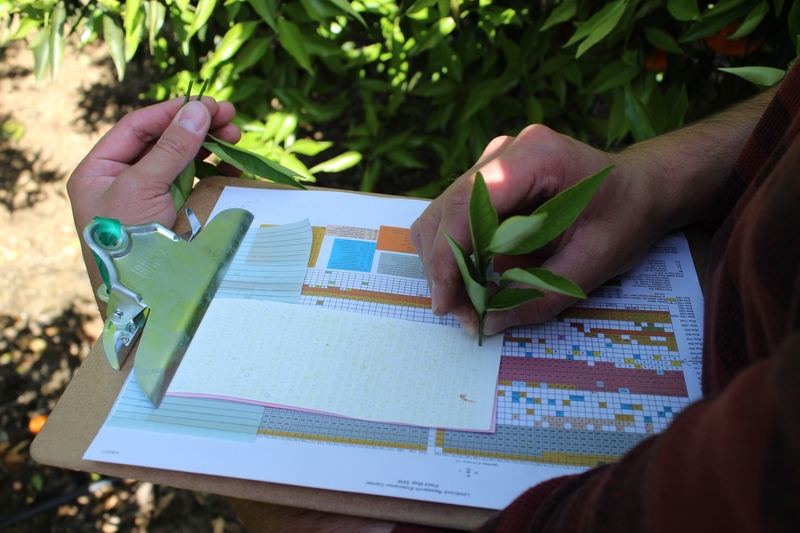 Joseph Spahn samples mandarin trees for Citrus Tristeza Virus at a research plot within Lindcove Research and Extension Center. Photo by Therese Kapaun. The direct tissue blot technique is an efficient field collection method for DAS-ELISA. Photo by Therese Kapaun. Therese was invited to teach the DAS-ELISA technique for CTV at CSU Bakersfield on April 20th. Plant pathology students brought freshly picked citrus stems from the outdoor courtyard trees, and applied their blots on a shared membrane. While incubation were in progress, Therese described the disease history of CTV in California, and discussed quarantine regulations and mandatory testing of citrus propagation material, as well as the ongoing work of the Central California Tristeza Eradication Agency and other industry efforts involved in the detection of severe strains of CTV. 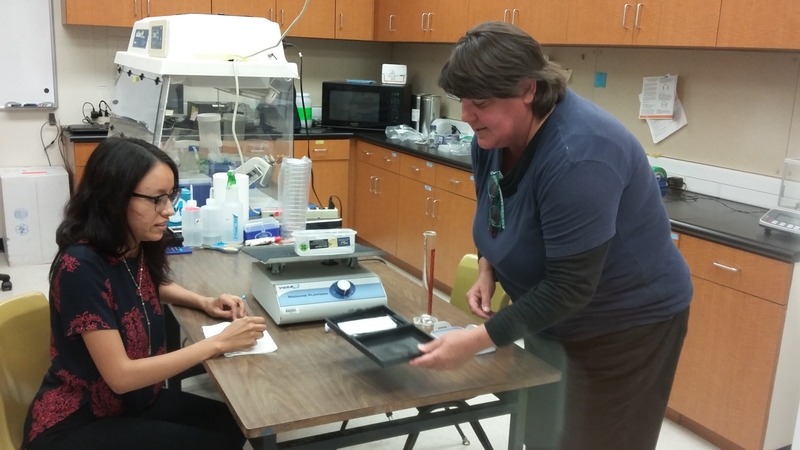 California State University plant pathology students enjoy hands-on learning of disease detection technology for Citrus Tristeza Virus at the Bakersfield campus. Photo by Isolde Francis. 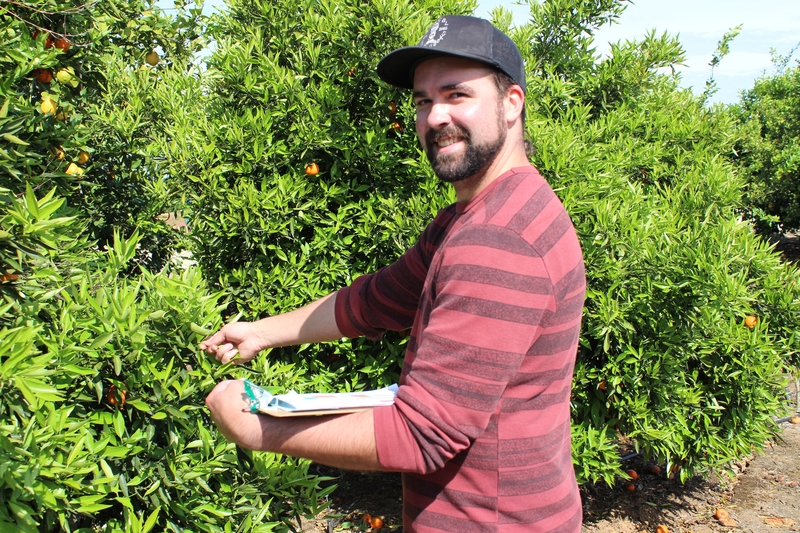 Each year the Lindcove Research and Extension Center tests every field tree for citrus tristeza virus (CTV), with funding from the California Citrus Nursery Board. This plant virus can be found in citrus trees worldwide, and certain strains of CTV can kill trees while other strains cause mild or no disease symptoms. The virus is phloem-limited, and transmitted by winged forms of cotton aphids, which are common at certain times of the year in the San Joaquin Valley. No cure is known for trees diseased by CTV, and those found to be infected at the Center are removed in order to protect the research plantings from infection. The Center utilizes the direct tissue blot immunoassay (DTBIA) method of sampling, and Therese Kapaun processes the blots in-house using DAS-ELISA. Briefly, four leaf samples are taken from each tree, and the leaf stems are snipped off at a cross section and quickly pressed onto a nitrocellulose membrane. Leaves are discarded on the ground, and the sampling moves to the next tree. The pressings from about 150 trees can typically fit onto a membrane the size of a 3" X 5" card. Membranes can be stored for weeks in a refrigerator if necessary, and laboratory processing can be performed in batches, taking less than four hours per batch. Results can be dramatic, as blots containing the virus will stain a dark purple color, and are usually visible without magnification. A five minute training video of our CTV field testing methods can be viewed on YouTube by clicking here. Blots develop a dark purple stain if they contain CTV.